Our high-grade garage epoxy coatings are gorgeous and durable. We utilize only the highest quality, industrial strength paint and seal. We are backed by our craftsman guarantee and use cutting-edge techniques to ensure quality and efficiency. We offer no flake, partial flake, full flake, and metallic coatings. The most durable, balanced coverage, slip-free, and dirt-free of them all is full flake! Each customer’s needs and desires are different, therefore the process can vary. We always encourage our customers to choose what is most durable and what most correlates with their overall goals. If you’re a homeowner looking to upgrade your garage flooring, we will come and carry out a free, no-obligation consultation on your property at your earliest convenience. Please contact us at 602-867-0867 to schedule today! We provide a slip-resistant solution for customers who are concerned about slipping. Does garage epoxy need maintenance? We recommend a top seal every 10 years. How do I take care of my garage epoxy floor? Simply mop with warm, soapy water. How long will is last? 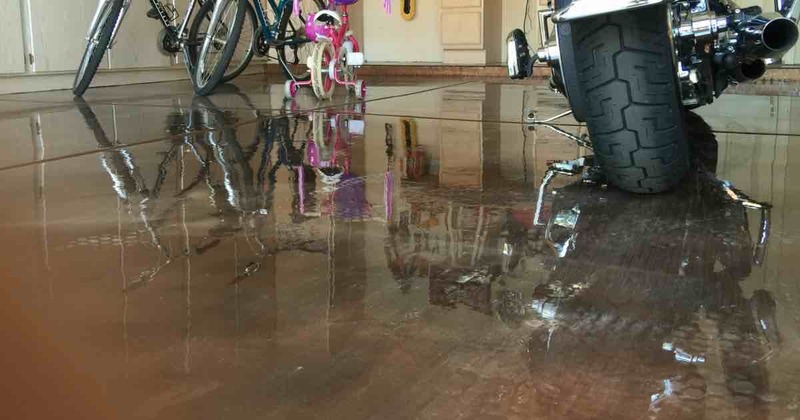 As long as your garage epoxy floor is properly take care of, it will last a lifetime. Installation is a 2-3 day process. We take one day to prep, one day to add garage epoxy paint & flake, and one day to sand and add an extra-protective sealer for additional durability. What are all of the garage epoxy options? Choose from a variety of garage epoxy paint colors and flake colors. We offer no flake (solid color layer), partial flake, full flake, and metallic coatings. After installation, when can I walk on my new floor? After installation, when can I drive onto my new floor? After installation, when can I close my garage door? Wait 24 hours to completely close your garage door. For safety reasons, we suggest leaving a very small gap between your new floor and garage door and we recommend locking the door that leads from your garage to the inside of your home. Can I have garage epoxy coating installed onto my sidewalk or other areas? Why would someone choose metallic paint? We typically install metallic garage epoxy coatings to interior game room floors, restaurant floors, bars, garage entertainment areas, and garage showrooms. Why would someone choose full flake over partial or no flake? It is really a matter of personal preference. Many people want to keep it simple with solid paint while others prefer the durability of the full flake. More than anything else, however, it is the look that people are going for.